Garbine Muguruza, Venezuelan pro tennis player, will be out due to her feet becoming too blistered to play. Muguruza’s left foot was bandaged but her foot blisters began restricting her movement as they became more painful. The No 3 player had to quit and joined the casualties list. Her withdrawal led to Angelique Kerber’s ascension to the current highest-rank player remaining in Brisbane International. Untreated foot blisters can worsen and make mobility extremely difficult and painful. For quality blister treatment, see one of our podiatrists from Foot HealthCare Associates. Our doctors will attend to all of your foot and ankle needs and answer any of your related questions. 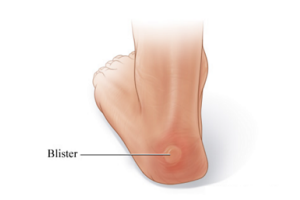 A foot blister is a small pocket that is filled with fluid, forming on the upper most layer of the skin. Foot blisters are filled with clear fluid, and may lead to drainage of blood or pus if the area has become infected.